Dental crowns are placed over damaged teeth. Your dentist may recommend that you undergo a dental crown procedure to restore weak teeth. 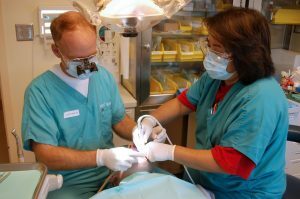 What Should I Expect During a Dental Crown Procedure? The procedure for installing a dental crown normally takes two separate dentist visits. At your first appointment, your dentist examines the affected tooth to make sure that it can support a crown. Then, your dentist numbs the tooth and the surrounding tissue before filing the tooth to create space for the crown. Alternatively, if the tooth is severely damaged or broken, your dentist may need to use filing material to “build up” the tooth. This creates a large enough space for the tooth to properly receive the crown. After reshaping the tooth, your dentist takes an impression of it. Once the impression is sent off to the dental lab where the crown will be manufactured, your dentist will give you a temporary crown to cover the prepared tooth. By the end of this first visit, your tooth will have a new temporary crown that protects it until the final crown is ready. When the permanent crown is ready, your dentist will call you in for a second appointment to remove the temporary crown and check the fit of the permanent crown. At this appointment, a local anesthetic will be used to numb the tooth for the procedure. Your dentist will then cement the permanent crown to the tooth using a special adhesive. Once your dental crown procedure is complete, it may take some getting used to before the permanent crown feels normal in your mouth. After a few months, your crown should look, function, and feel like a regular tooth. If you have questions regarding dental crowns or wish to schedule a crown procedure, make an appointment with your Longmeadow dentist today.